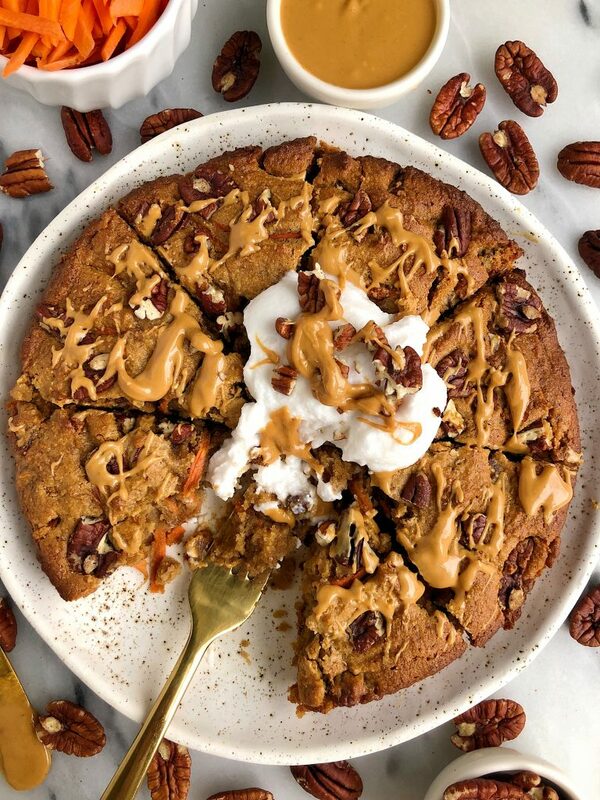 Gluten-free Pecan Carrot Cookie Cake made with less than 10 ingredients for an easy and healthy carrot cake cookie skillet recipe! The carrot cake binge continues friends! 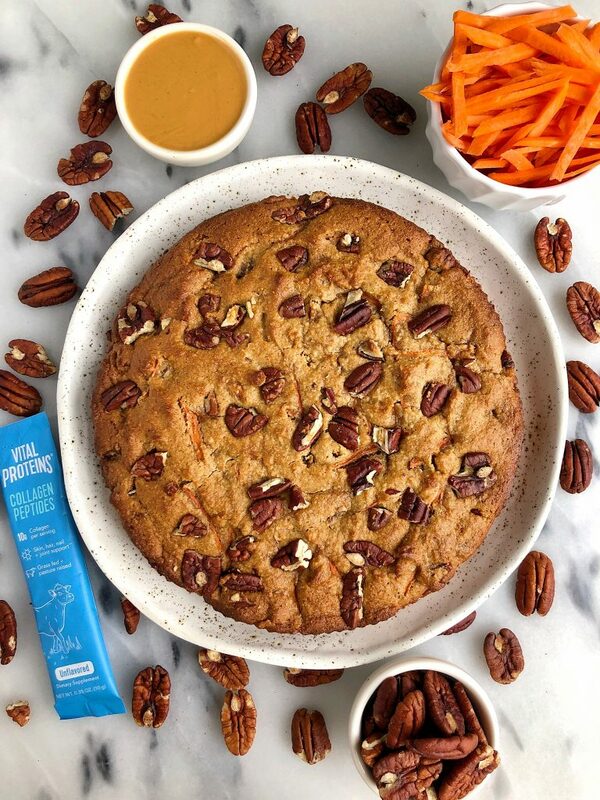 When the only way you’ll eat carrots is when their hidden in a dessert, you have to get creative in the kitchen 😉 And this Gluten-free Pecan Carrot Cookie Cake is absolutely insane and officially my go-to dessert right now. It isn’t often a dessert recipe satisfies me that doesn’t have chocolate in it but this recipe hits the spot. This carrot cookie cake has a crunchy outside and that soft gooey cookie center we all love. Plus you can top it off with some ice cream of choice or even some creamy coconut yogurt for a little fancy snack or dessert actions. Did I mention you only need to dirty one bowl to make this recipe too? Easy prep, easy clean up and you are set. I also add in some of my favorite Vital Protein’s collagen peptides. You guys know my obsession with collagen peptides and baking with it. I love sneaking it into recipes because it adds extra protein and dissolves right into the batter. I use the regular collagen peptides here so it doesn’t add any flavor either. Just all the benefits to consuming some extra collagen in our diets (more on that here). 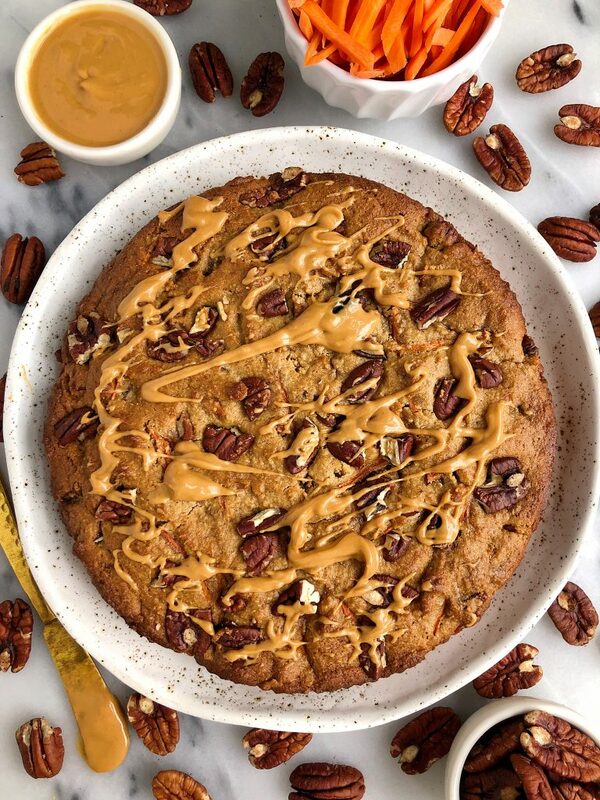 My Gluten-free Pecan Carrot Cookie Cake is egg-free, gluten-free and even dairy-free for ya. No refined sugar either and we just use a little coconut sugar to sweeten it up a bit. I love using to sweeten recipes a little without making them too too sweet. This recipe is perfect to serve for Easter or really any spring brunch or get together for that matter. I hope you guys love! When you finish up with this recipe, here are a few of my other favorite carrot cake recipes: Raw Carrot Cake Candy Bars, Healthy Bakery-Style Carrot Cake Muffins and One-Bowl Vegan Carrot Cake Loaf. Allow the cake to cool for few minutes then slice and enjoy! Thank you Vital Proteins for sponsoring this post! It means so much to me to partner with brands I love and use daily! Any suggestions for subbing out the collagen to make it vegan? Just leave it out or replace it with something else? Can we make this without the collagen? Or does it need a sub?